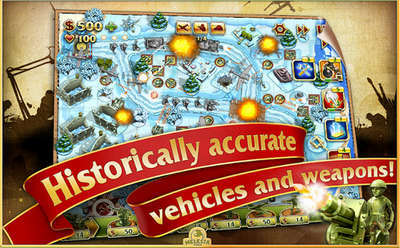 Melesta games's Toy Defense 2 (current version 2.7.0.1) is the second installment in the TD series. For the uninitiated, the game is a classic tower defense that mixes toy soldiers with World War II locations and unit types resulting in a very addictive and satisfying strategy gameplay experience. In Toy Defense 2, you get a map with predefined positioning spots where you can place your units (4 in total - soldier, anti-tank gun, anti-aircraft gun and airbase). Enemy units, tanks, jeeps, bikes and planes try to get from one end of the map to your base as your units try to stop them. 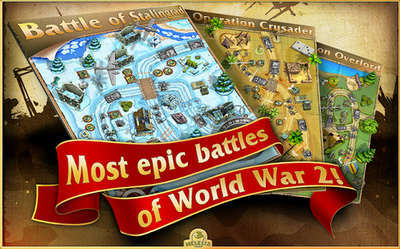 - Get a Christmas gift from the Headquarters! - Play on Arena without Facebook log-in! Install Apk, copy ‘com.melesta.toydefense2′ data folder to sdcard/Android/obb/ Launch the Game and have fun!